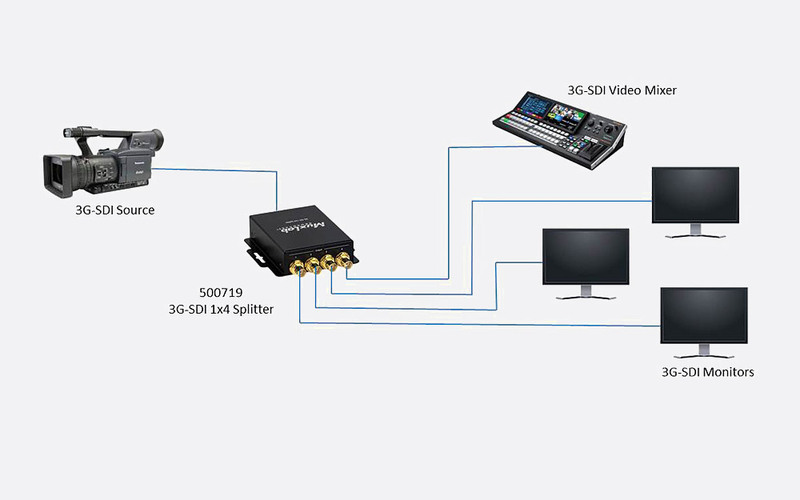 These video splitters are used in video production, post production, broadcasting, and live event applications and split one 3G or 12G source signal and output to a number of displays. 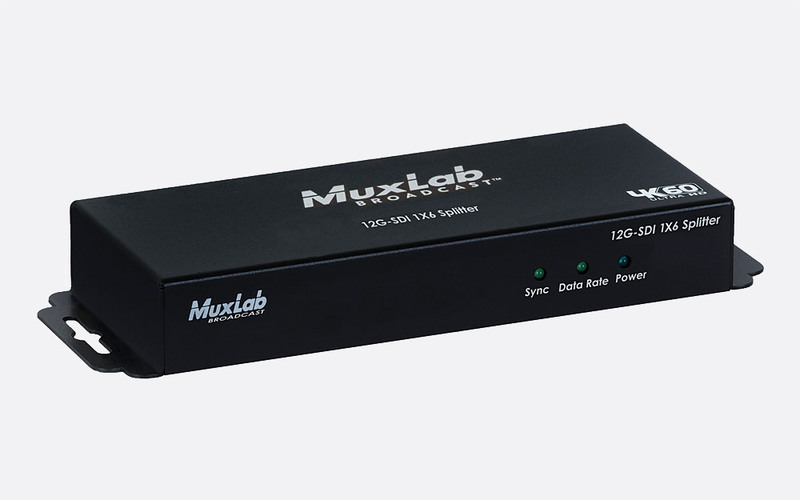 This 1x4 splitter takes a single 3G/HD/SD-SDI source input and distributes an amplified signal to up to four 3G/HD/SD-SDI compatible displays. The 500719 automatically detects the signal type and re-clocks at the output stage to extend the displays to distances up to 90m (3G-SDI), 150m (HD-SDI), or 300m (SD-SDI) when using RG59 or better cable. (see:'RG59B/U RF/Video Cable'). Sources up to 1080p, 60Hz are supported along with up to eight audio channels. 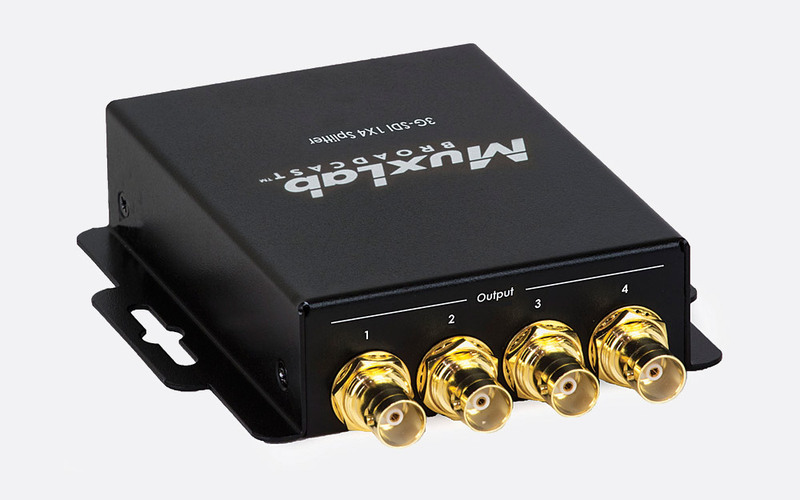 The splitter has a metal case, with the front panel of the unit having a single gold-plated 75ohm female BNC input connector, a locking 2.1mm power connection for the 5V DC power supply included, and two multi-coloured LEDs to indicate both power/sync status and data rate. The rear of the unit houses four gold-plated 75ohm female BNC output connectors. Dimensions: 27 x 78 x 105 (HxWxD) mm. Weight: 0.32kg. 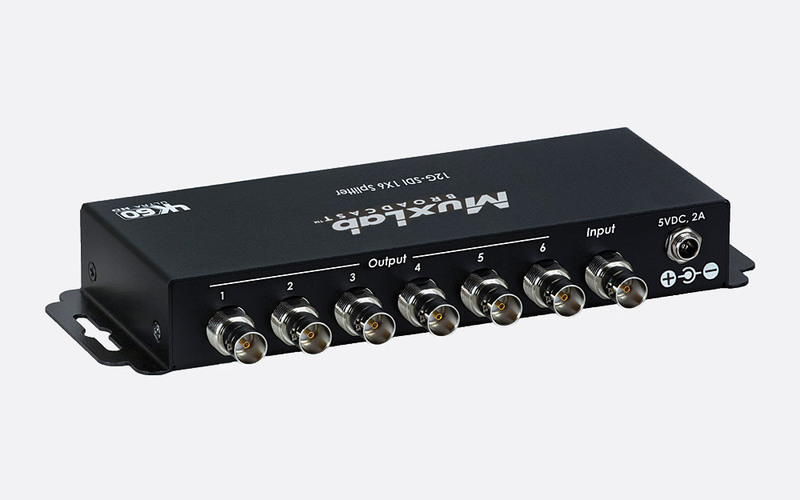 Like the 500719, the 500718 is a splitter that can cater for 3G/HD/SD-SDI signals. 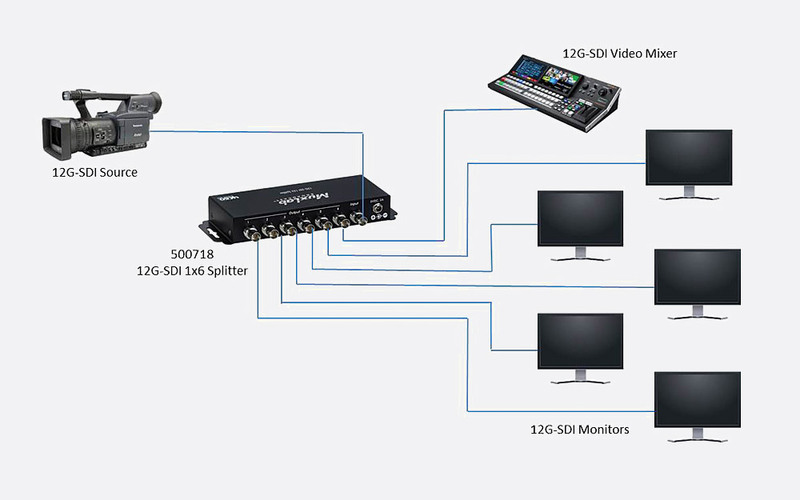 However it also supports 12G and 6G-SDI and resolutions up to 4K, 60Hz before distributing to a maximum of six outputs. The output signal is regenerated after the unit automatically re-clocks for distances up to 45m (12G-SDI), 90m (6G-SDI), 90m (3G-SDI), 150m (HD-SDI), and 300m (SD-SDI) between source and display. 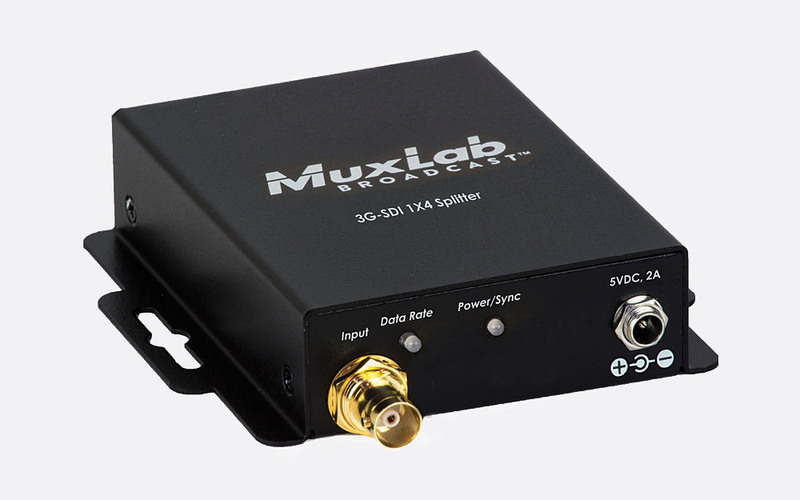 For maximum support MuxLab recommend using RG59 or better cable, (see:'RG59B/U RF/Video Cable'). The splitter has a metal case, with the front panel having three multi-coloured LEDs to signify power status, sync status and data rate. The rear of the unit houses seven gold-plated 75ohm female BNC connectors - one for input and six for output connectivity. A 2.1mm locking power supply input for the included 5V DC power supply is also positioned on the rear panel. Dimensions: 27 x 180 x 78 (HxWxD) mm. Weight: 0.78kg.